Amplifier EDFA GPON 8 ports of 22 dBm (Erbium Doped Fiber Amplifier) is a combiner with 8 output ports CATV + PON, FTTx. Output power for each port of 22 dBm. It consists of a built-in WDM multiplexer. Ideal to guarantee an excellent solution for RF Overlay television (3rd window). It amplifies the lambda of 1550 nm and multiplexes it with the optical output of the GPON chassis. Output with SC / APC connector. Input PON SC / APC. CATV input SC / APC. 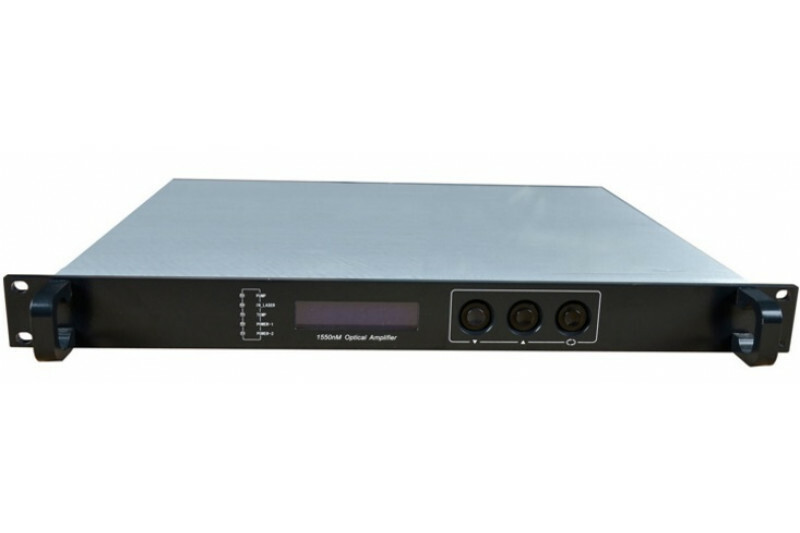 Amplifier EDFA GPON 8 ports of 22 dBm optical output ports, high performance, high output power (22 dB guaranteed) and low noise level. It works in the spectrum band of 1530 - 1565 nm. Each output port of the optical amplifier, SC / APC connector, has a built-in CWDM multiplexing. It has 8 PON input ports, with SC / PC connector, each of them can be joined with a PON output of the OLT. CATV connector connector SC / APC. Each optical output port at λ 1550nm is multiplexed with λ 1310/1490 nm. Ideal for TV solutions in RF Overlay (known as TV in 3rd window) in FTTx systems, to offer a triple play solution. The EDFA 8x22dBm is a combiner with high linearity, optical isolation, DFB, thermoelectric cooling laser DFB. The machine is equipped with a stable light energy export circuit as well as a temperature stability control circuit and laser thermoelectric cooling device to ensure optimal laser performance and long-term stability. The microprocessor software monitors the status of the lasers, the operating parameters are displayed on the digital panel (VFD). The red light goes on to warn on the digital panel. Ports: 8 output ports with CWDM. 8 optical input ports used by the OLT and an optical 1550 CATV input port. Each output port for the optical amplifier has a high performance CWDM incorporated. Cooling system: double cooling system to protect the laser pump. Remote SNMP: It has an RJ45 port for SNMP Plug-in to perform remote management at any time. JDSU, Bookham and Fitel: high performance laser. LCD display: shows the parameters, functions and alarms. Power supply: Double power supply in AC or DC. Working range 90V ~ 265V AC or 48V DC.